Years: Early 1950's - ? Italian: 1.378" x 24 tpi Body Markings Campagnolo World Logo - "Campagnolo"
Campagnolo logo on the hub centers changed over the years, the earlier hub logos were more detailed, with extended lines for the feathers and such. The logo in this listing is a later one, more basic, from the late 1950s. The alloy flanges were pressed onto the steel center shells. 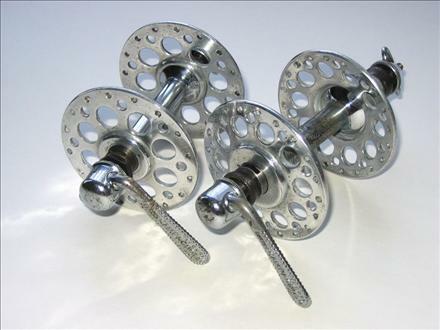 hubs were available as freewheel, fixed, and freewheel/fixed double-sided. Details: Hugo Koblet won the 1951 Tour de France in July using Gran Sport derailleurs.